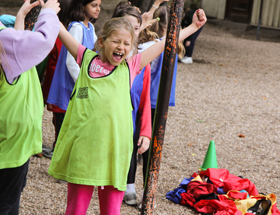 At Ermitage, we believe that a healthy, active lifestyle helps students build character and balance their studies. In cooperation with local partners, Ermitage offers a variety of sports, both as intramural clubs and competitive teams for High School and Middle School students*. Depending on the students' program, there are also physical education classes integrated into the school day. The Boys Varsity and Girls Varsity Basketball teams compete annually in Denmark in a Round Square International Basketball Tournament as well as with other schools in the surrounding Paris area. The Boys Middle School and Girls Middle school Basketball teams compete in local tournaments and games with schools and Basketball clubs from the surrounding Paris area. The Boys Varsity and Girls Varsity Soccer teams compete in local and international tournaments and games with schools and soccer clubs. The Boys Middle School and Girls Middle school Soccer teams compete in local tournaments and games with schools and Soccer clubs from the surrounding Paris area. Students participate in Yvelines and Ile de France championships and qualify regurarly for the national championship. *Club and team offerings are available to students depending on their age and program.